Finally able to get some of my DT projects done- so glad to be creating again!!! Of course with a new little one, it takes a lot longer to get things done. 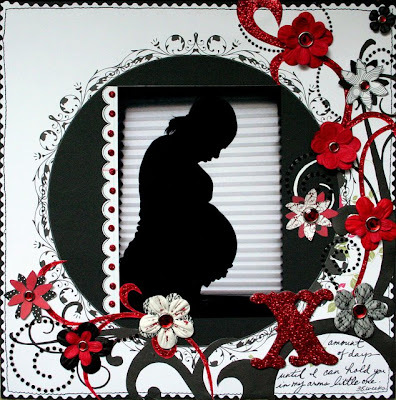 This acrylic album was so fun to create!! The album and acrylic word ("memories") are from myacrylicalbum.com. I used Junkitz Destinationz papers, K&Co chipboard stickers and lots of other goodies like the magic mesh and fibers that have been in my stash forever!! All of the pictures are from our family vacation to Jamaica. The following projects were created for Zsiage DT. 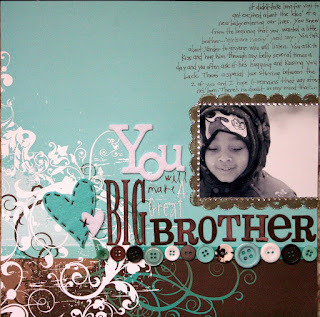 This little cube was inspired by Keisha Campbell's altered photo cube in the current issue of Scrapbooks Etc. As soon as I saw it, I knew I wanted to create something similar! I bought a plain wooden cube from AC Moore and decked it out with Zsiage's papers and chipboard and lots of stickles. Love how this turned out! 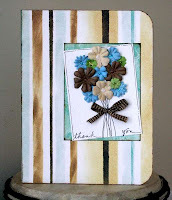 A quick Thank You card using Zsiage's New England papers and primas. A LO featuring Zsiage's Starr Brites II papers and film alpha and brackets. The topic for this LO was inspired by a crop I participated in at serendipityscrapbooks.com. With pictures this cute, you'd think I'd be a scrapping machine. No such luck! I'm so sleep deprived that the creative side of my brain is not firing off any new ideas. I need to get back in the swing of things, I have quite a few DT projects due by the end of the month! ACK! Here are a few photos that I took yesterday of my guys...I still can't believe I am the mother of 2! I love how that sounds...I have children! Xander was 10 days old yesterday and according to his last doctor appointment (4/18) he weighs 8 lbs. Yesterday was also Troy's and my anniversary- we celebrated 14 years together, 6 as a married couple...time flies, I remember meeting him in college! 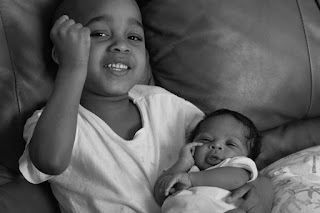 Donovan was so thrilled that I finally let him hold his little brother. He takes being a big brother seriously and insists that I refer to him as big brother. He's been so helpful to me and is so protective of Xander! I've said it before, but it's worth repeating...Xander has stolen all of our hearts! I love seeing how DOnovan softens up when he's around Xander. The shirt says it all! He spends most of the day sleeping peacefully (no matter how much I try to wake him) so he's well rested for the "party in his crib at 2 am"! I'd forgotten how tough sleepless nights can be. I have some serious luggage under my eyes! How handsome is he? 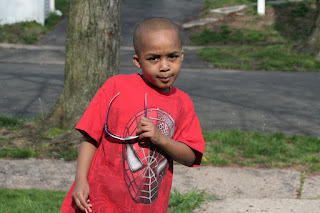 He has to be the coolest little boy! Hopefully I'll have some layouts to display soon! Challenge #2 is up at the Dream Girls Challenge Blog. This time we challenge you to get real. Reality show, that is. Create a layout using the name of a reality show as your title. Your layout must include some form of stamping, AND you must use felt somewhere. We can't wait to see what you come up with! 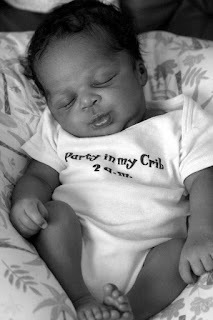 He's what I came up...check out the blog to see what the rest of the Dream Team Divas created! It was only fitting that I chose the title "Big Brother", I stamped the frame using a scalloped border stamp and included 2 felt hearts and a felt word ("YOU"). journaling: it didn't take long for you to get excited about the idea of a new baby entering our lives. You knew from the beginning that you wanted a little brother..."girls are nasty" you'd say. You talk about Xander to anyone who will listen. You ask to kiss and hug him through my belly several times a day and you often ask if he's hugging and kissing you back. There's a special love stirring between the 2 of you and I hope it remains that way after he's born. There's no doubt in my mind that you will make a great big brother. 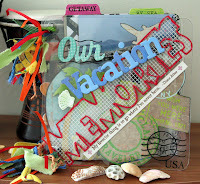 After a long, very creative 7 week journey aboard the Scrapbooking Around the World contest at scraplovers.com, I just found out that I WON!!!! My reward? Two months as a guest designer for the site. Woohoo! I loved participating in the contest, my creative boundaries have been stretched and in the end I have an amazing set of layout that I truly love! I can't wait to create for the site! I am happy to announce that we were able to bring Xander home from the hospital this past Saturday. I'm glad we were only separated for 24 hours. I took him to his first pediatric visit today and he is doing very well! Donovan has been sooooo excited about his brother. He keeps asking if he can kiss and hug him- he has a cold and it's been so hard telling him that he can't, but I have allowed him to kiss the baby on his hand. Donovan is already so protective, he often tells me "mommy, you have to be gentle"! Too cute. The winner of the Guess Baby's Weight RAK that I posted last month is Jenny! There were 32 guesses, some very close, but Jenny hit the weight on the nose!!! Xander was 7 lbs 9 oz! Jenny I left a post on your blog, just pm me your address and I will send your RAK. I included 3 of my current favorite things: black velvet thickers, paper glaze, and the coveted new white pen from Ranger, along with some patterned papers other things that I hope you will enjoy! 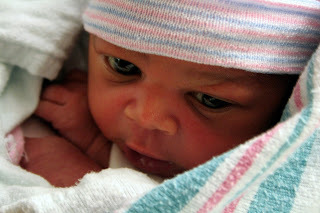 I think it'll be pretty difficult for me ever forget the way my beautiful little boy made his entrance into the world. With reading previous posts, you know that I've been in labor pretty much since Saturday- nothing too serious, but just enough to make me impatient and uncomfortable as heck. Monday I visited my OB and was told that I was 2 1/2 cm dialated and that made me very happy because I figured I was well on my way to finally giving birth. I got up a little after 7 am Tuesday morning to get Donovan ready for school and then went back to bed until 11 am. I wanted to do a few minor things around the house so I wouldn't have to worry about them once the baby came and to help keep myself busy, but the only thing I could manage to do was grab a few pillows and a blanket, the remote and phone and lie down on the couch. I felt an overwhelming need to rest and in that moment, I knew that the baby was coming that day or early the next. With all of the nesting that I had done since my maternity leave had started, this was my body's way of shutting down and preparing for labor. I layed on the couch for the rest of the afternoon. I remember my MIL calling me and "requesting" (jokingly of course) that Xander stay in until Thursday so she wouldn't have to cancel her plans. My reply was "Thursday? You must be crazy- this baby is coming TODAY"!! I said "I'm going to tell you like I told my sister (who had jokingly said he had to come after her important meetings) that this ain't about you, it's about me getting this baby OUT!!" "I miserable"! We talked for a bit; I told her how I had felt all day, that I was starting to have minor contractions and was sick and tired of laying down all day. My body was starting to ache! After getting off the phone I decided that I had had enough and needed to move about to get the ball rolling. I put some clothes on and drove to the scrapbook store where I teach, 1/2 hour away. As soon as I walked in, the owner asked me if I knew how many times someone had asked her if I had the baby yet. I asked her if she knew how many times someone had asked me that very same question. "You win" was her reply! LOL! I told her that I was starting to have contractions and that I needed to do a little walking around to help out a bit--what's a girl to do other than shop?! She reminded me of the dream I had- the one where I suddenly went into labor in the store after my water broke in the bathroom...I got a good laugh at that one because here I was in real life and in labor! I went to pay for my stuff and a contraction hit, I rubbed my belly and breathed through it and she just looked at me and said "oh no you don't missy...don't "ooo ooo ooo" in this store". She is a riot! On the drive home another contraction hit, which now put them at about 15 minutes apart. Suddenly I had this undeniable urge for tacos and sweet tea so I stopped in Shop Rite and bought the stuff to make tacos. (backtracking: for the first 4 months of my pregnancy I was so so sick and unable to eat that I had lost 10 lbs. I went on Zofran to help stop the vomiting and the first thing I craved was tacos- not the fast food type (yuck), but the Ortega types that you can make yourself at home). I went straight from the supermarket to pick Donovan up from preschool at 6:00pm and then we headed to White Castle to get some sweet tea. I drove home and my contractions had really started picking up, it was now a little after 6. I started making my tacos and they were coming about every 3-5 minutes...now I knew I was in business and started to watch the clock to see if they would progress this way for the next hour and then I'd know that it was time to call my doctor. About 30-35 minutes later, I had sat down to eat...my tacos of course...and the contractions stopped! I was confused because I could see the light at the end of the tunnel! That was short lived because once I stood up again, they started back where they left off. I talked to both my sisters on the phone, all the while walking between the kitchen and living room and breathing through contractions. I had sent Donovan upstairs to watch TV, so I could concentrate without him "mommying" me to death. I was getting excited because I knew the time was near, but thoroughly pissed off at the same time, which quickly turned to anger because I could not get in contact with Troy and I was going through this by myself!!! My contractions were starting to come 2-3 minutes apart, but this would happen for about 40 minutes and then they slowed down to about 10-15 minutes for 1/2 hour... I took a nice, long, hot shower- this helped when I was in labor with Donovan. I called my friend Doral and put her on high alert (She was going to keep Donovan and take him to school for us) and then packed a bag for Donovan. I remembered constantly debating when I should call the doctor. I knew that I did not want to have the epidural- I wanted to go natural like last time, but I didn't want to be immobilized in the hospital, contracting for hours. 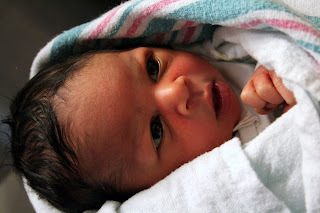 I wanted to labor at home as much as possible so I could move around as I pleased, which was a tremendous pain management help...now I understand why some women opt for home births...I never understood this concept before, but I certainly do now! 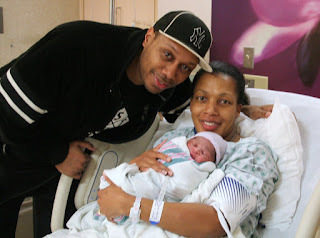 This was the tricky part because you just don't know, every labor and birth is different. I decided that it was time to call my doc's practice. I paid a couple of bills online, made a few "it's almost time" posts on the scrapbook sites that I visit and then made the call. I told the on call doc that my contractions were coming every 2-3 minutes, he asked if this was my first child, I told him no and he said "Ok, come on in and we'll check it out". I told Troy it was time to go. He rushed and put the bags in the car, put Donovan's shoes and coat on over his pajamas and carried him to the car. It was now about a little after midnight and suddenly at that very moment, my contractions started doubling up...they started coming really hard and strong almost as if someone just threw a switch. I quickly realized that I may have waited just a little too long and hoped and prayed that we make the trek to the hospital in enough time. It seemed to take me forever to get in the car. We drove to the other side of town and dropped Donovan off at my friend's house at about 12:25 am. The hospital was 1/2 hour away and I prayed the entire time that we'd make it. I remember worrying that we were going to get stopped for speeding because Troy had (carefully) run about 3 red lights and then did about 85 miles an hour on the Parkway and Turnpike. He kept saying "hang in there babe, we're almost there", but I could hear the panic in his voice. I remember at one point telling him "shhhh please be quiet, I need to concentrate"! I'm one of those, I need complete silence, in order to concentrate on breathing and getting through these contractions type of women! Once we got off the Turnpike, I began worrying about the ride down Route 18. There was some major construction going on and I just thought, "how the hell am I going to survive all of those bumps?"! (I knew the road pretty well as this is the one that I travel everyday to and from work). I was really moaning and groaning, but I made it down that road. Our exit was in sight and it wasn't long now....unfortunately for me there was more construction and Troy hit and bump really hard while I was in the middle of a contraction. OH.......MY.......GOD!!! The pain that shot through me....!! OMG, OMG, OMG! I have no words to explain it! We were around the corner from the hospital and now it was ON! Troy pulled up to the emergency room door and ran in to grab someone. There was no way that I could get out of the car. The wheelchair was right there in sight, but I couldn't get out. The triage nurse and Troy kept saying you have to get out and I kept saying "Ok, Ok, Ok.....I can't mooooooooove"! The nurse replied "honey, we have to get you up to L&D" so you can have this baby. It was purely by the grace of God that I was able to hoist myself out of that Jeep Cherokee and into the wheelchair. I prayed "God please do not let me have this baby right here", that bright red Emergency Room sign was not what I wanted to see as I welcomed my son into this world. I sat in the wheelchair, but my feet were dragging we had to stop and it seemed to take forever to put them up. Can you believe they actually tried to triage me? WTF?! Couldn't they see I was on the verge of spewing amniotic fluid all over the floor? Someone with sense called L&D and was told to send me up immediately. It was a loooong trek from emergency to L&D. In L&D, everything seemed to move at warp speed, especially my contractions. Everyone kept telling me to move here and move there, couldn't they just pick me up and put me where I needed to be? I didn't have the strenghth to move! I was bombarded with questions, most of which I ignored the first time around...couldn't they read my mind? I just wanted to close my eyes and push! Where was Troy? Couldn't he answer for me? Then I heard his voice finally...he had gotten lost in the barrage of hallways and elevators after parking the car. I remember contracting and then doing that "mmmmmmmmmmmmmm" afterward- everyone starting yelling, "don't push, don't push". But I really had to push, the pressure down below was building and I felt as if I was going to burst. I did it again and on the 3rd time I said "I really have to puuuuuuuuuuuuuuuush". Finally they caved, the resident cut my amniotic sac, 2 pushes later and Xander was here! 1:29am, just 1 hour after we dropped off his big brother- talk about cutting it close. Xander was born at 1:29 am on 4/9/08. He weighed 7 lbs 9 oz and was 19 1/2". It all happened so fast!! Troy was so overcome by the sight of blood, the tools and the super quick delivery that he almost passed out!! He started breathing fast, feeling dizzy and getting hot so the nurse took him in the hallway to sit down. The on call doc came to me and introduced himself. I guess because of our schedules, he was one of the doctors in the practice that I didn't get to see during my pregnancy. He said "didn't I just speak to you?"... "you did a great job...cut it close, but at least you can go up and get some rest now"...rest...finally someone who made sense! Anyway, Xander was breathing a little fast so they sent him to NICU. 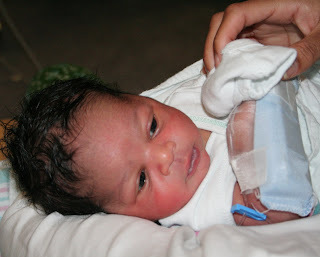 His breathing was fine by the next day, but his bilirubin levels were a little elevated. My baby has jaundice and has to stay in the NICU until the levels go down, which means that I had to leave the hospital without him...sniff, sniff! But, I'd rather be safe than sorry- he's healthy, doing well, totally gorgeous! I can't believe how much he looks like Donovan did when he was born. The similarities are amazing, I've already matched up a few photos and you really can't tell them apart. I had a feeling he was going to look like his big brother. 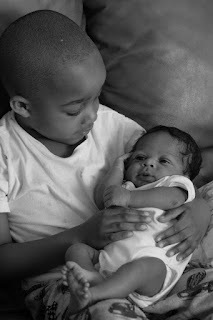 Donovan was all over me during my pregnancy- it was his way of bonding with his "baby brudder". Because Xander was in the NICU, Donovan wasn't able to see him other than the 30 second peek we managed and the pictures. He was so disappointed, but he's being suprisingly patient and understanding about it...well as patient and understanding as a 4 year old can be. LOL! I can't wait to get Xander home so we can all start bonding as a family of 4! Here are a few pictures- Daddy, Mommy, and baby Xander! Look at those proud smiles! Here's my little boy flashing me with those big brown eyes. Just one look...that's all it took...I'm so in love! Isn't he gorgeous? Can you see the reason why even air gave me heart burn? Now if he were a girl, he'd probably be bald. Be still my heart! One of my fave photos so far- so you know this will be on a layout very soon!!! He's flashing those "Puss 'N Boots" eyes again, this time at his Aunt Nett...yeah, he has her wrapped around his finger already, too! I think I may be heading to the hospital either tonight or really early morning. I have been having some serious contractions, they are coming every 2-3 minutes- they started coming like that for about 30-40 minutes and then would stop. I just took a nice, long, hot shower and they've had more of a regular pattern. I'm trying to judge it so I do most of my contracting at home. I don't want to lay in a hospital bed all night especially since lying on my back slows the contractions, I also don't want to misjudge since we have a 30 minute drive to the hospital. I called my friend Doral and put her on notice. We're going to take Donovan to her house on our way and then she'll drop him off at school tomorrow morning. I'm in a bit of pain, but I know the end result is going to be so worth it. Wish me luck and I hope I have some more definitive news to share! If you don't hear from me, you'll know why!! My little guy is taking his sweet ole time entering the world. He's so comfortable, maybe I need to shake things up a bit! I went to the doctor today and am happy to announce that I am 2.5 cm dialated- so excited about that because at least I'm getting somewhere! I'm glad I don't have many important things on my plate right now because I can hardly concentrate on anything but the baby. I'm feeling a little obsessed because I'm really looking forward to meeting him, I want to hold him and kiss him and see who he looks more like...I'm ready for our external bonding time. I'm ready to be the mommy of 2; although I know it's going to be crazy challenging, it's a journey that I am eager to embark on! 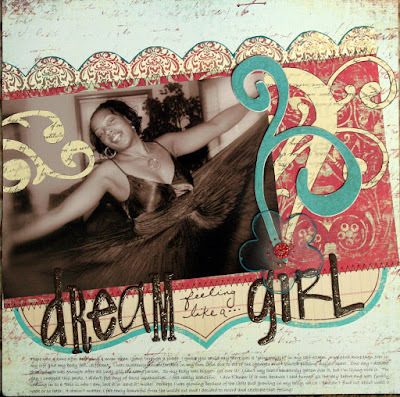 The Dream Girls have a brand new forum! Stop by and see what we're up to by clicking on the button to the right!! Stop by scrap-diner.com April 11-18 for the Blast-A-Thon crop! 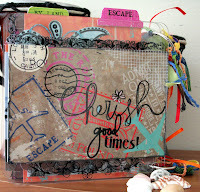 This is my 7th and final layout for the Scrapbooking Around The World contest at scraplovers.com. I had a ball doing the challenges! 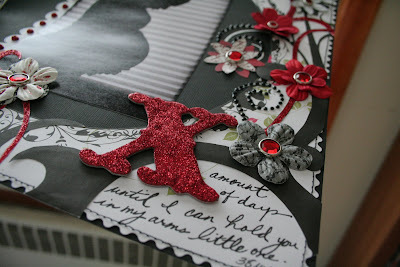 This week, I had to create a LO using 10 patterned papers, a monogrammed title, and a cluster of red elements. Throughout the entire contest, we were only able to use photos that we took ourselves- I took this one using my tripod and self timer. Taking a picture in from of a light source without using the flash gives you an automatic silhouette! close-up- remember shaped scissors? I pulled out a pair and put them to use on the edges of the background paper! I started having labor pains in the middle of the night- around 1:15 this morning. I've been really trying to will this baby to come. They went on for about 2 hours, really erratic but nothing too painful or that I could time. I was so excited thinking that he would probably be here by the afternoon. I ended up falling asleep and then they were gone. Xander is playing with my emotions! Now my back is killing me! So, 6 more days and I'm growing more impatient with each day! I think I've gotten spoiled because by this time with Donovan, I was leaving the hospital as he was 8 days early. My friend is due today (Donovan's godfather's wife)- this is their first child. I called her today so I could have someone to comiserate with and guess what, the same thing happened to her at almost the same time!! How weird is that? She said her contractions lasted about an hour, then they were gone and then she was up for a few hours. No baby for her either. I have a doctor's appointment Monday- so we'll see what happens! Ok I got this tag from Wendi and I had to do it, it is sooo different and really fun. Here are the rules: You Can OnlyType One Word, Not as easy as you might think. Now copy or forward, change the answers to suit you, and pass it on. It’s really hard to only use one-word answers. 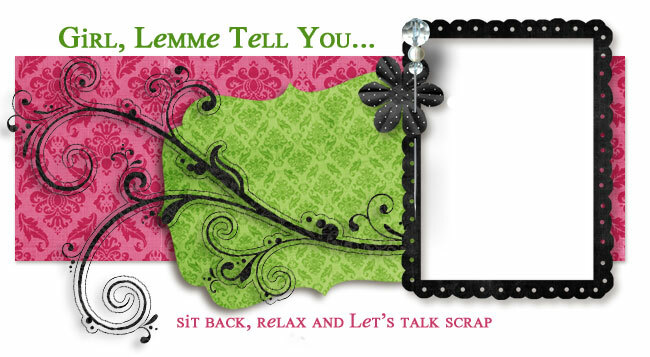 "You are cordially invited to our Mad Hatter Tea Party at Serendipity Scrapbooks. Since Mother's Day is right around the corner we thought that a Tea Party would be appropriate. So come on out and celebrate the many different hats we wear as women. There might be even a little May Day Celebration thrown in to our Tea Party. (note: crumpets and tea will be served!) The Mad Hatter Tea Party will begin on Friday April 25th through Sunday April 27th. We will also have pre crop challenges that will begin on Friday April 18th. All challenges will be posted by 12 noon est/9am pacific. Our awesome Design Team is busy coming up with some really neat challenges and games to keep you inspired. The Mad Hatter Tea Party will consist of 20 prizes to be had in one small weekend. Oh and you can't forget about our Blue Light Specials. They can be any where from 20% off to 50% off of specific items. Everyone loves our Blue Light Specials and you never know when they will appear over the weekend. You can also compete for points to be crowned Alice in Wonderland of our Tea Party. We hope to see you there for some wonderful inspiration and loads of fun. 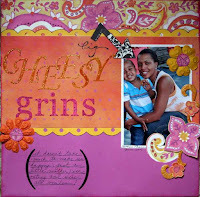 www.serendipityscrapbooks.com"
That means the first challenge is up on the Dreamgirls Challenge Blog! Check it out here and please play along with us, it'll be tons of fun! Here's my take on the challenge. I can't tell you how much fun it was to create this LO, especially "girlifying" the grungeboard with paint, glossy accents and glitter! journaling reads: There was a time after becoming a mom when I went through a phase- I guess you could say there was a “minor glitch” in my self-esteem. I weighed more than ever in my life and my body felt…different. I was suddenly uncomfortable in my own skin due to all of the changes and I started picking myself apart. One day I decided that enough was enough; after all I was still the same person. So my body was bigger- get over it! I can’t say that I have truly gotten over it, but I’m living with it. The day I snapped this photo, I didn’t feel any of those insecurities…I felt really beautiful! I don’t know if it was because I had turned 33 the day before and was finally settling in to a “this is who I am, love it or leave it” niche! Perhaps I was glowing because of the little bud growing in my belly, which I wouldn’t find out about until a week or so later. It doesn’t matter, I felt truly beautiful from the inside out and I decided to record and celebrate that feeling!